Locally purchased, stage 1,fully serviced with clean car proof. Timeless cruiser styling combined with all the features you need for the long haul. 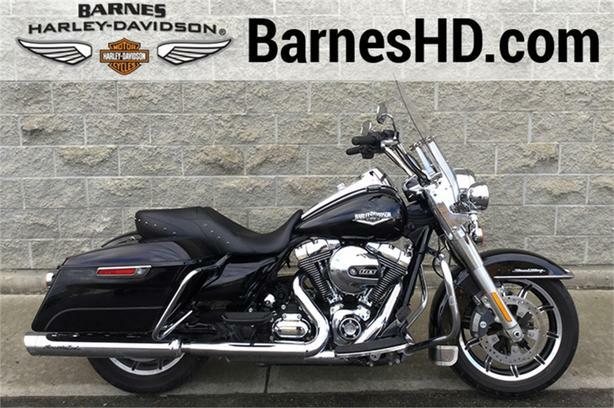 The Road King® motorcycle truly is the king of the road.The 2014 Harley-Davidson® Road King® model FLHR is powered to perfection with the performance you need for Harley® touring. As part of Project RushMore, for 2014 the Touring Road King® model has been redesigned from the ground up to make the ride better than it's ever been. The Harley® Road King® features a powerful new air-cooled high output Twin Cam 103(TM) Harley® engine with 6 speed cruise drive transmission, providing more performance power for passing, hill-climbing, and riding with passenger and luggage. The 2014 H-D® Road King® motorcycle features the new Reflex(TM) anti-lock braking system (ABS) with dynamically, electronically linked brakes for optimum braking in all conditions. There are also all-new gauges and redesigned saddlebags that open easily with one hand. The H-D® Road King® model FLHR has a classic Hiawatha headlamp that is a defining feature of this bike. Big and commanding, the Harley® Road King® model's headlamp hearkens back to the Big Twins of the 60's. You get nothing less than the latest in materials and technology. The 2014 Road King® motorcycle features a new anti-lock braking system (ABS) with linked brakes provides optimum braking power to each wheel regardless of road conditions.